Twin sisters Joan and Jayne Michaels are not only two of the most talented designers I know, they're also two of my dearest friends, and when I started Design Therapy I knew their firm was one of the first I wanted to feature. 2Michaels' work is always relaxed, tasteful and timeless and I often turn to them for inspiration. 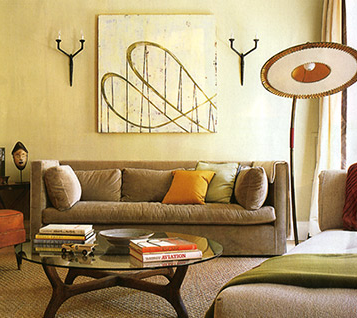 This particular room gets me everytime....is it modern, vintage, masculine, feminine...does it even matter? Quite simply, one thing I do know is...it's beautiful!